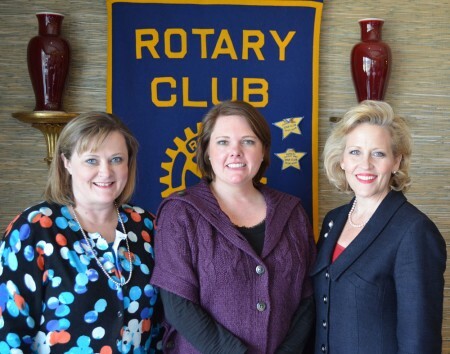 Sidney James Nakhjavan (right), the Drummond Thorne Stukes executive director for Auburn University’s Cary Center for the Advancement of Philanthropy and Nonprofit Studies and Women’s Philanthropy Board, spoke to the Auburn Rotary Club about the center’s program offerings and efforts. The center promotes financial and philanthropic responsibility, mentoring and nonprofit leadership through community outreach programs and an undergraduate minor for Auburn students. The center is based in the historic Halliday-Cary-Pick home, which was generously gifted to Auburn University in 2011 by Frances Pick Dillard, a founding member of the Women’s Philanthropy Board, and her family. Pictured with Nakhjavan is pictured with center associate Kim Ellis Walker (left) and Club President Martee Moseley (center).